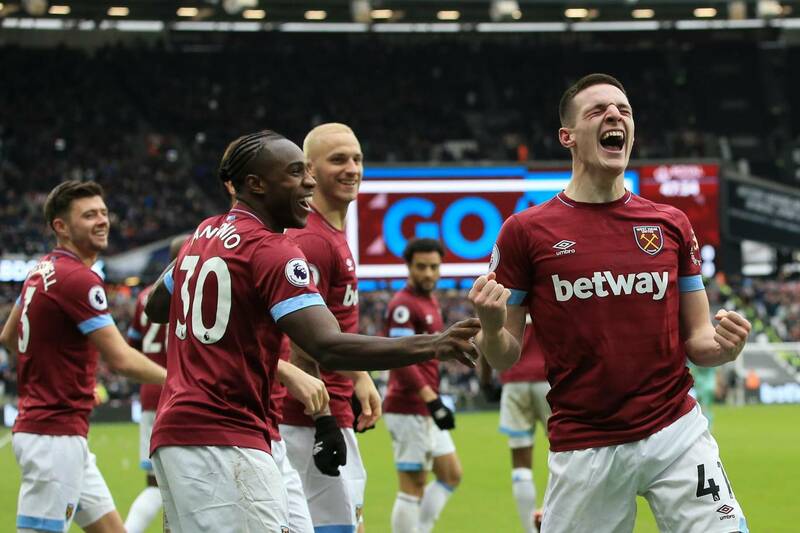 West Ham ended a tumultuous week with an unexpected 1-0 victory over Arsenal in front of the largest Premier League crowd in West Ham history today. The 60,000 supporters saw 19 year old, Declan Rice, score his first goal and put the home side firmly into the top ten of the league. Coverage around the globe was focused on West Ham’s contract dispute with Marko Arnautovic, whose agent and brother are seemingly trying to force a January transfer to a Chinese club for massive wages. This Payet-esque drama seems different as Manuel Pelligrini has a much stronger club and a much more cohesive dressing room than Slaven Bilic’s, two years ago. The coming days will be interesting as Arnie’s future becomes clearer. But today he did start at forward and played a good game against a strong Arsenal defense. The opening half saw both teams take their chances. West Ham did a fine job stifling Aubameyang and Lacazette, who were unable to get service in danger areas as they have for most of the season. An early Lacazette miss and an early Filipe Anderson strike outside the post were two of the best chances. Declan Rice was unable to connect on a short-range header on a corner kick late in the opening half. But missed opportunities and strong defending from both clubs led to a 0-0 break. Early in the second half, the Hammers were lining up for back-to-back corner kicks and on the second attempt Samir Nasri found Rice lingering in the middle of the penalty area, just behind the line of defenders. His 14 yard strike curled just inside the far side post and gave West Ham all the goals they would need. Nasri, making his return to the Premier League for the first time since 2016, endured some vocal discouragement from the visiting fans, who still remember his 2011 departure to Manchester City from the Gunners. With the one goal lead, Pelligrini replaced Arnautovic and Nasri with Andy Carroll and Robert Snodgrass, and though West Ham didn’t threaten as strongly as earlier, they did play tough possession football and help run the clock. The three minutes of stoppage time went fast as West Ham either possessed or harassed the ball, and once Jon Moss sounded the final whistle the Hammers had their first home league victory over Arsenal since 2006. It vaulted the East London club up to eighth place for a few hours, until Watford retook that position. With the transfer window still open, the days leading up to next weekend’s visit to the Vitality Stadium will be dominated by Arnautovic. If the board hold him to his contract, does he strike like Payet? If they let him go, do they replace him with any quality? What is the atmosphere like with the other players during this drama? And most importantly, how badly does Marko want to leave versus his brother? This season has been a great run. Pellegrini has won with injuries, and still has FA Cup hopes alive, even as European football seems a bit more unlikely. Arnautovic is great talent, and hopefully will remain in Claret until May. But as this drama unfolds, please stay with TheWestHamWay.co.uk for all the latest transfer news and injury news. The bottom line today was that on this day West Ham were every bit as strong a side as Arsenal. Finally the supporters at the London Stadium have a club that is fun to watch. West Ham: Fabianski, Zabaleta, Ogbonna, Diop, Cresswell, Noble, Rice, Antonio, Nasri, Anderson, Arnautovic.